Here is your Sunday Morning just before brunch wine podcast. 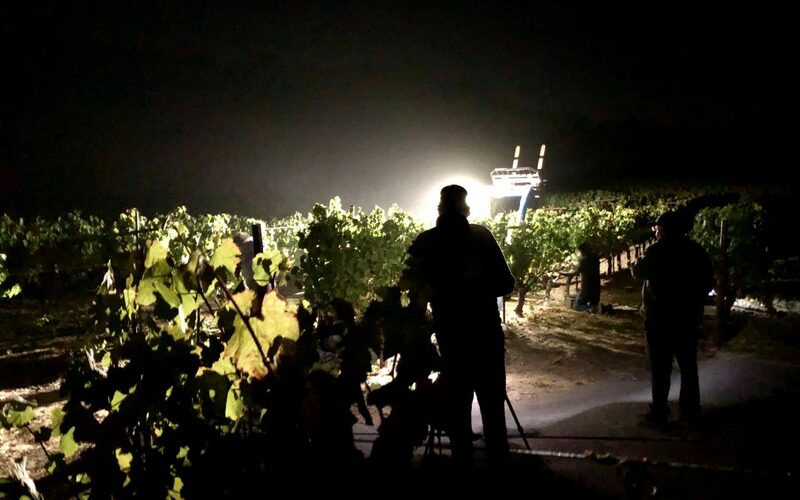 While you were sleeping, Sonoma Valley was hard at work harvesting wine grapes at night. Do you love that cool-climate Pinot? Maybe that spicy Syrah or that dark inky GSM blend? To make these wines, the grapes must arrive at the winery very chilled. Warm grapes will begin to ferment almost immediately. Start picking at 7:00am, and the grapes will be 85 degrees by mid-afternoon. And that’s how bad flavors can arise – like vinegar (acetobacter) and nail polish (acetone). 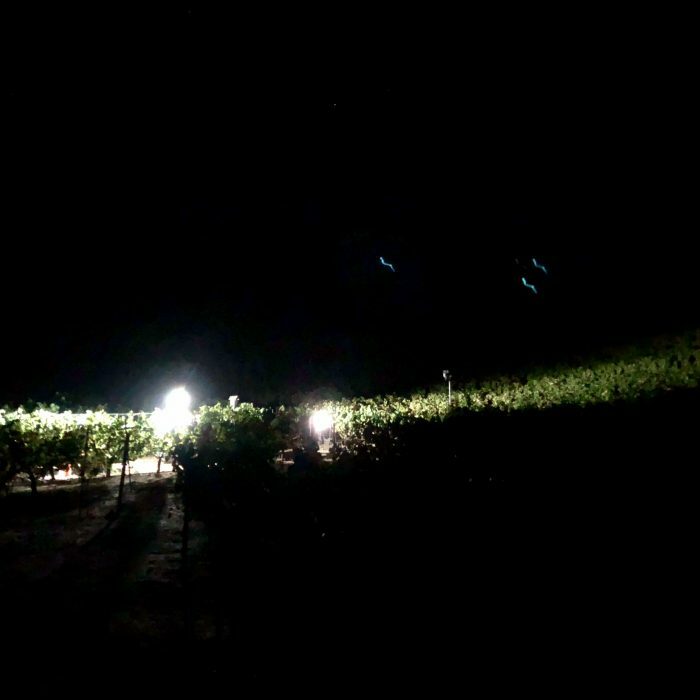 So picking at night assures the grapes will arrive at the winery in mint condition. Many vineyards are too large to be picked in a few hours. 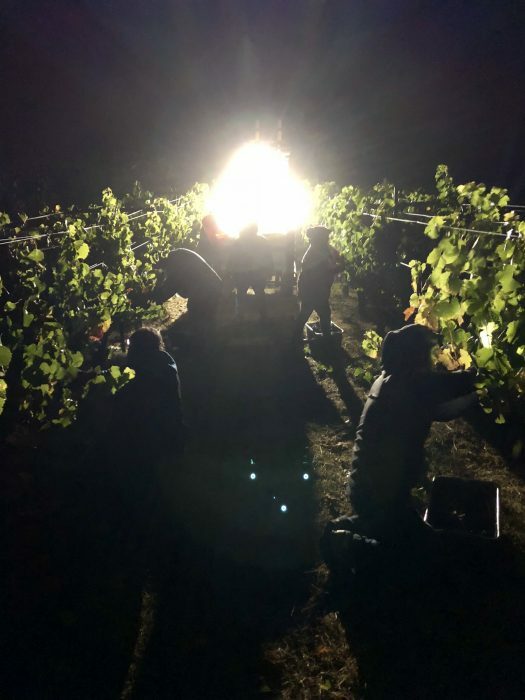 So we must start a few hours after dusk in order to get all the grapes picked, loaded, and delivered by the early morning. 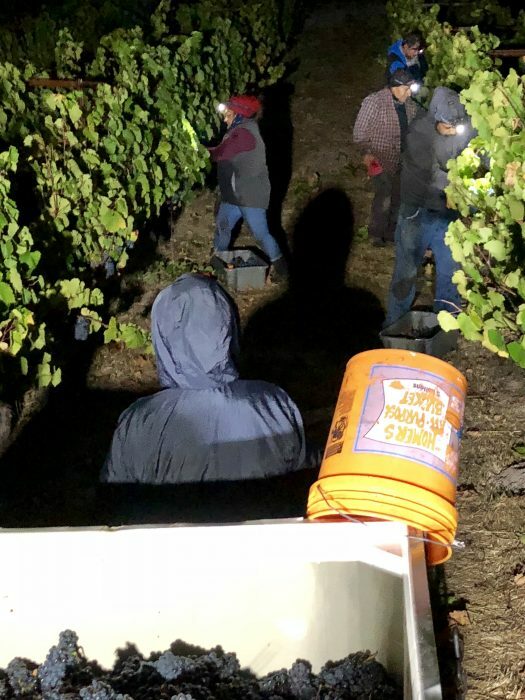 Whether the vineyard is large or small, wineries (and winemakers, like me) prefer that fruit arrives at daybreak – so that we have the early morning to calmly process the fruit and move it into fermentation tanks. And then run the labs: brix (sugar), pH (logarithmic scale used to specify the acidity or basicity of an aqueous solution), TA (total acidity), etc. And that’s how a night harvest goes! Hopefully a “Lucky & TASTY 13!” Thanks for providing a view into this part of the wine world. You have a real writing talent. Great descriptions! I love the videos! Senora Marta is also a machine! What an impressive process. Hope all is well Ken! Thank you for sharing!! A wonderful and nice night!!! can’t wait for a taste. NEAT VIDEOS AND NARRATIVE. I’M ANXIOUS TO SAVOR THE VINTAGE.. THANKS FOR KEEPING ME INFORMED.